I was up bright and early on Tuesday morning and made my way with my breviary (a book containing the liturgy of the hours) to St. Peter's Basilica. I passed through security and made my way into the Church and found a priest offering Mass in English at the altar of Pope St. Leo the Great's tomb. I joined another man (who I do not think spoke English). We stood, knelt and received Holy Communion and the priest asked where I was from as he left with the chalice to return to the sacristy. Next I went down the spiral stairs near the statue of Saint Andrew the Apostle to descend into the crypt and pray at the tomb of Pope John Paul II, as well as the tomb of the Apostle Peter (I usually prayed the rosary during this time). 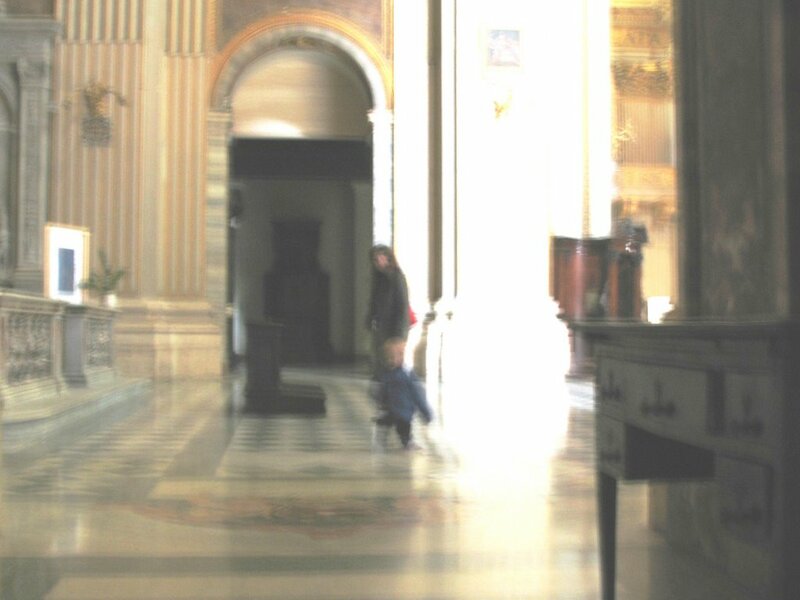 In the early morning there were few people in these spots, most were conected with groups saying mass at the different chapels. 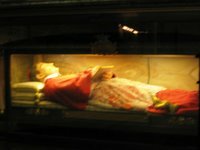 I then went up the same stairs and sat in one of the pews in front of the tomb of Blessed John XXIII and prayed the office for the day. As I made my way back to the apartment, I made a usual stop for some expresso and to pick up some pastries to bring back for the others to have for breakfast. This morning I went into a different shop on the Borgo Pio. As soon as I entered there was the priest whose Mass I had attended earlier that morning. He was a Dominican and he told me that he taught at the Angelicum. He invited me to join him, but I told him that I was sure the family was probably waiting on me back at the apartment so I really should be going (at this point I didn't get his name, although I think he told me that he was originally from Missouri--I would meet him again). I brought back the appreciated pastries by Katie and the baby, but rejected by Joseph who is an incredibly picky eater (he feasted on butter cookies bought the day before). Then we set out for the Gesu, a church we hadn't been able to find the day before in the rain, thankfully today the sun was shining brightly! We stopped in at a couple of souvenir shops on our way to the bus stop and also into the Carmelite Church on the Via del Conciliazione Santa Maria in Traspontina, I said a short prayer before the altar of St. Barbara for my mother (would have another chance when we visited a church dedicate to the Saint later in the day. 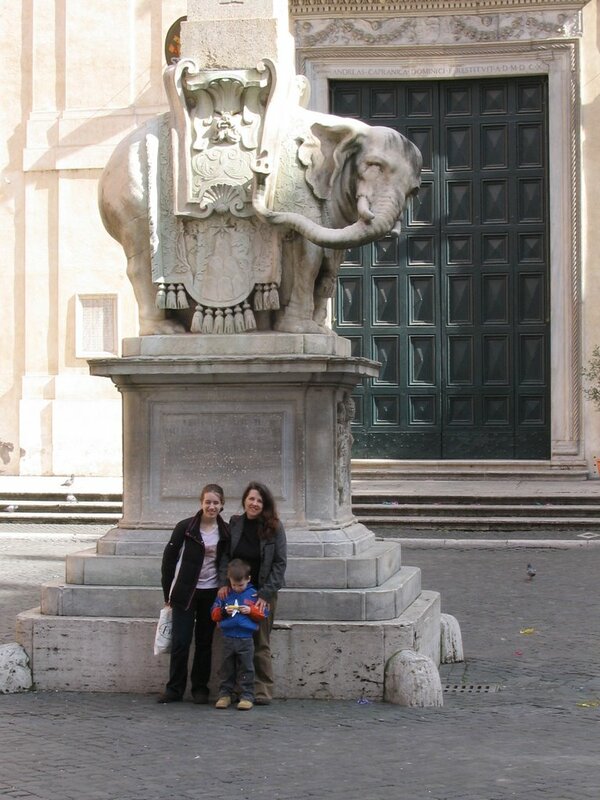 We ran into Sussana Pinto of Rome Reports who also writes for Our Sunday Visitor, she was there to attend Mass. 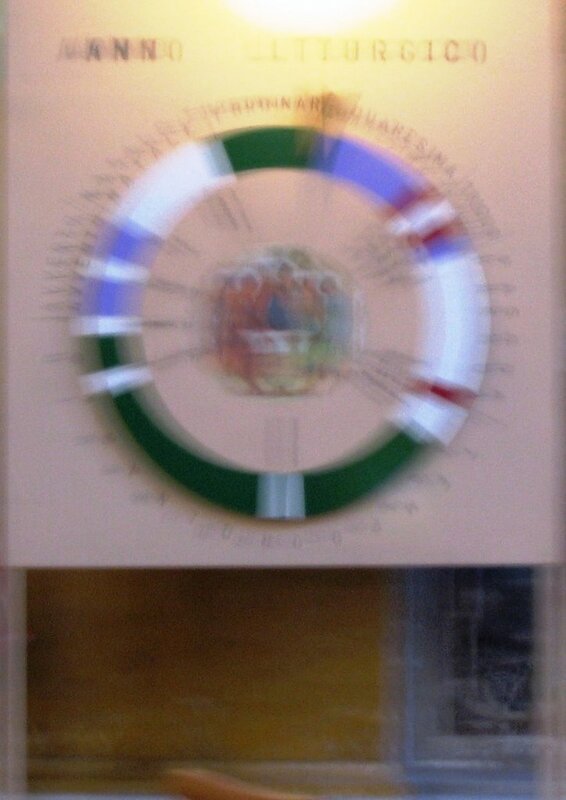 Something that caught my attention in this church was a "liturgical calendar" that was kind of like a time clock. Here is a blury picture of it (I apologize but somehow my camera settings got messed up and I haven't learned to review them--well I have now, but hadn't then). We headed out to catch the Express bus. The Gesu was exactly where it was supposed to be and one street over from where we had been searching for it the day before in the rain. But it is amazing how much easier it is to read a map, find the right street in the sunshine. Joseph gave a Euro to the beggar at the door (something by this time encouraged him to do, both as a form of almsgiving for our pilgrimage and to help him overcome youthful greed). Inside the Church, something truly amazing that a photo does not even begin to capture, but I'll post one that I found online of the Triumph of the Holy Name of Jesus (IHS)...what you don't pick up in the photo that is startlingly evidend in person is the 3-D quality of the ceiling; the heretics falling off to the side literally look like they are plunging down toward you--an absolutely fascinating image that one could spend hours meditating on. 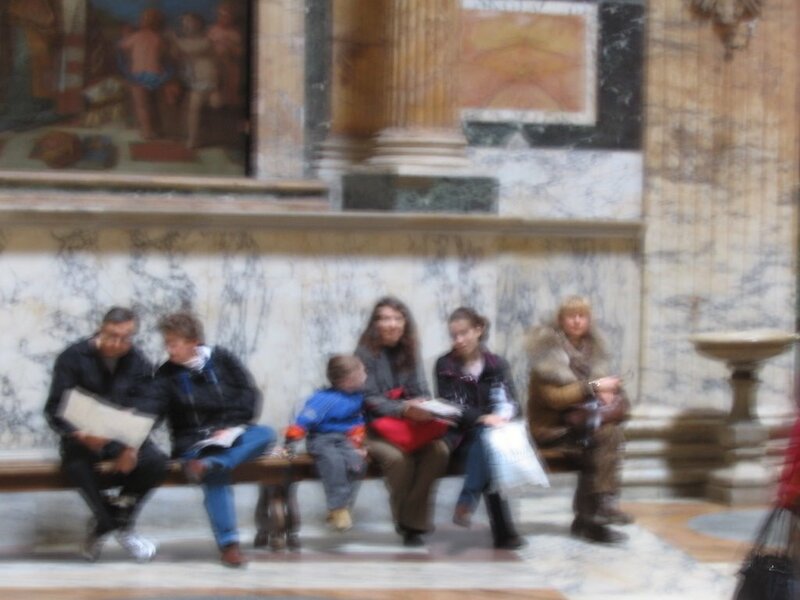 In In some ways you can kind of capture that in this photo, because the images descending look indistinct, sort of like you need 3-D glasses to focus the picture properly, but in reality you don't and this is an amazing catechetical lesson that what we see isn't always really what it is. We prayed at the tomb of St. Ignatius of Loyola and St. Francis Xavier and took in the beauty of this church, one of my favorites! 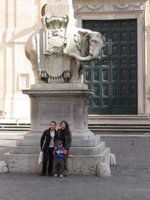 Next we made our way to Largo Argentina near where Julius Caesar was murdered, where there are the ruins of pagan temples not made into churches and an investation of cats that are well taken care of by the local populace. After a short viewing we made our way toward Campo de Fiori, which unlike the picture in the link, is actually quite crowded with vendors selling everything from fruits and vegetables to Bob Marley t-shirts. Perhaps the latter can be attribed to the spirit of Giordano Bruno who was burned at the stake here for declaring that there was no center of the universe--there obviously were as many individuals who thought that they were the center of the universe back then as there are today and unfortunately poor Giordano was as guilty of this sin as anyone. Ahh but I'm getting ahead of myself, first we came upon a church. 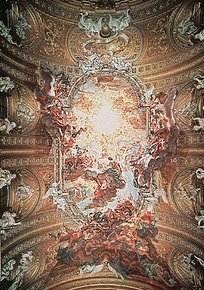 One of the non stop pleasures of a walk in Rome are the hundreds of churches that don't make the tour books, that you walk in and find to be three times as larges as the back home parish church and filled with art that would make the art museum back home world class. 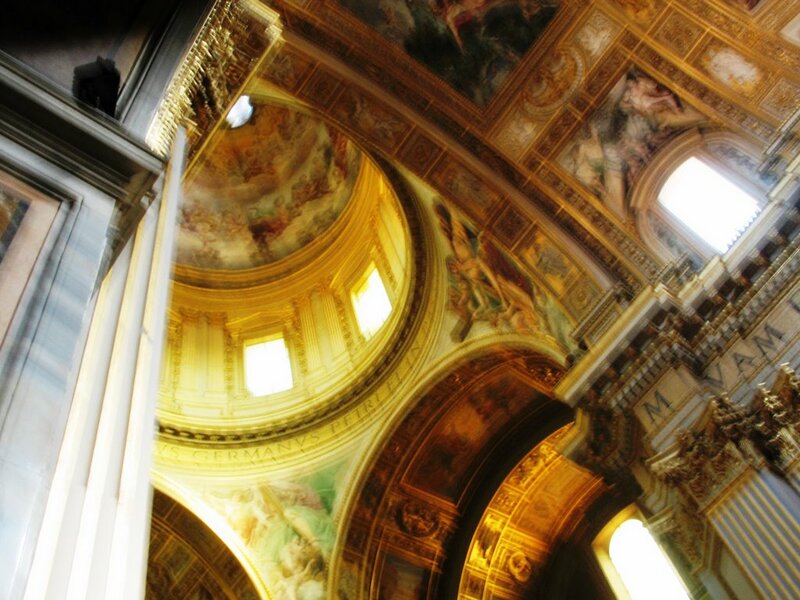 Here we came upon San Carlo ai Cantinari a church that boasts the third largest dome in Rome next to St. Peter's and another church that we will visit in a second. "Carlo" is the Italian rendering of Charles, just as Karol is the Polish rendering of Charles--the Charles in this case being St. Charles Borromeo (Karol Wojtla's patron saint...really in English the Pope's name was Charles). Like all churches in Rome, fascinating. While Amy, Katie and Joseph stopped for a snack, the baby and I paid a visit to my mother's patron Church, Santa Barbara dei Librai (St. Barbara of the books). I think I picked up a holy card at this church, but I've yet been able to find it (I still haven't unpacked). Arriving at Campo de Fiori, I went and sat with the baby near the statue of Giordanno (I wonder if he inspired the frozen pizza of the same name). Amy bartered with a few merchants to buy some bloody oranges (not there real name but a description of the fruit covered with an orange peel, but blood red fruit inside--very appropriate in a plazza formerly dedicated to public executions). Here Amy and I tried to make a few phone calls with none of our intended callers answering the phone. 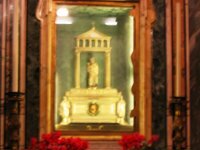 I went into Sant' Agnese in Agone and took this picture of the skull of St. Agnes in a reliquary. This church was built on the site of an ancient brothel (Rome is filled with examples of how Christ conquers all)! The size of St. Agnes' skull bothered me--it was no bigger than a very small infant, the porter told me that it wasn't the entire skull but just part of it. 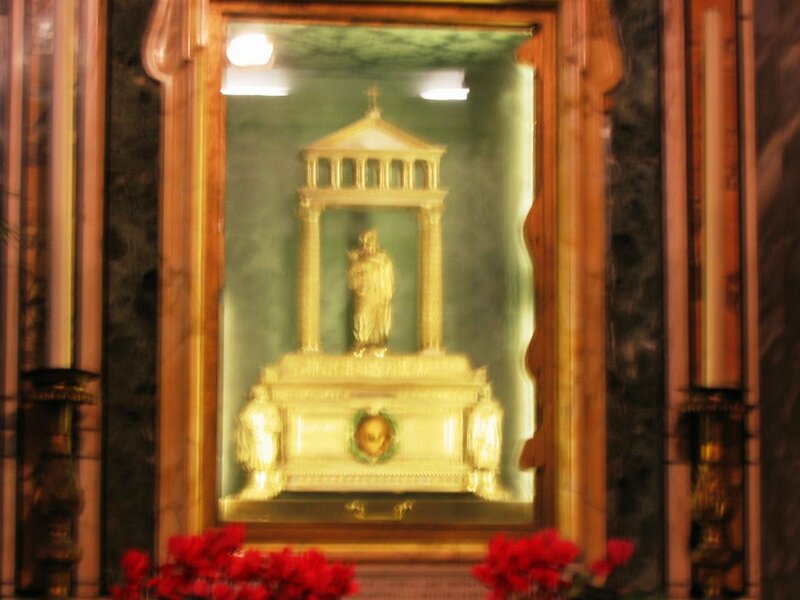 If you look at the gold box you'll notice a little opening, that is where the skull of St. Agnes is. Saint Frances of Rome (whose feast was a few days ago, was baptized here). 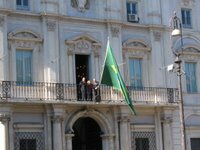 Then it was off to Largo Argentina to catch the tram to Trastevere for lunch with the great communications leaders of the Vatican! Very interesting. Please continue with your itinerary. And add more of your pictures. fabulous stories of your travel, thanks for sharing.